It is also becoming clear that those artists who are not able to see themselves as owners, but as only speaking to ownership, are putting themselves on a flailing track of dependency stumbling into this digital era. Like an timid bird in a cage who prefers the security of confinement to the freedom of the unknown. Albeit in some rare cases a luxurious bird cage, still and all, a condition of confinement the will not allow for ones own personal or creative development to flourish. So don’t cry for your freedom, if you are getting paid to tone your message and your soul down. By accepting, you are the biggest accomplice to your own confinement. There are as many channels of disillusionment interwoven into the digital landscape as there are advantages. I hear a musician telling me that the incredible band I heard last year has now broken up because the singer was too this or the drummer did not like that, or guitar player wanted to start his own thing. Yes we all hear these situations more and more. Its what I call “the tragic hero complex “. Anyone can catch the bug, even the mousy keyboard nerd who misunderstands his position in the group hierarchy because the label said they like his tune the best. Its that singular personality that we have been programmed to believe must reign when in fact its a group effort. The idea of “the group” does not have to exclude ones individuality when looking at the impact of an entire career. Just think of the impact Elvin Jones had as a drummer powering Coltrane’s illustrious quartet or John Bonham in Led Zepplin. On the other hand, I don’t know how much htlm those cats would have learned to keep themselves independently present on the net of today. Lets assume they would have been as dynamic with the tools of today as they were effective with the tools of thier time. Could it be that the ways groups were delivered to our turntables back then, apply to anything the independent producer of today would have to deal with in order to get his groove on business-wise. What I am suggesting is that through the necessity of engaging the digital age, creators will be motivated to develop new ways of structuring their creative output where the multiple groups structure could see variations never imaginable before. A composer moves around with his music and performs with different sets of musicians in different location on the planet. One group idea could be meant only for recording, another for live, another for experimenting with performance art. You can see where this can go financially as well. You can have your own group and have stock in a group that you and other members have invested collective time in. 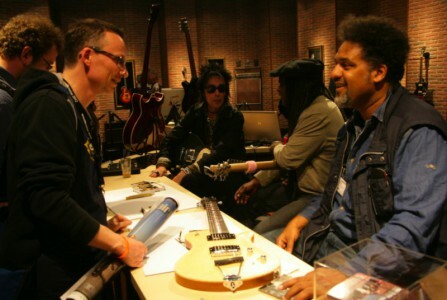 These ways of engaging the new world of music can be empowering if we accept responsibility. How about instead of indulging in the alpha dog, ego overload, one could try and be emotionally smart. Sometimes the deepest thing you can do is, just get up on the stage and play. 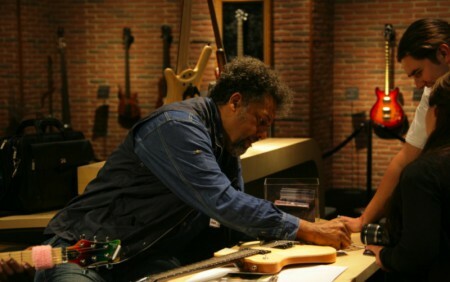 It is a great forum for group therapy and after all, its what musicians do best. A lot of problems have been worked out through and incredible performance. If this all is bringing more questions than answers, then “good”, cause musicians who have historically push the borders of creativity, cannot afford to rest on their laurels as the threat of the new game white wash, looms erroneously on the horizon of many incredible careers. 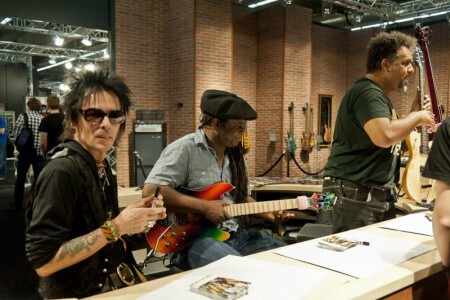 Here in Frankfurt with two wonderful colleagues, guitarists Regi Wooten and Earl Slick doing the meet and greet thing. Just some things I’ve been thinking about.